The practical tips of decluttering and minimalism are helpful, but it’s connecting with a story from someone who is most like you that encourages change. This is not in any way meant to discount the awesome men minimalists out there. I love you too. This is simply a reminder that women can be minimalists too. Last year, or maybe 2 years ago, I received an email that opened with, “Dear Leo …” The email was in response to an article that Leo Babauta wrote about simplicity and the holidays. I don’t remember the exact words, but the email was from a woman scolding Leo. She said that simplicity was easy for Leo because he had a wife that was taking care of everything. She told him that wives and moms were busy making holiday meals, decorating the house, and taking care of their families. She summed up the email by letting Leo (and me) know that simplifying everything was easy for men, but impossible for women. I am just like you. I thought simplicity was for other people living lives that are less complicated than mine. I am a wife and mother, and minimalism changed my life. I waited until I was in my late 30s to start simplifying. I was working full-time in advertising sales. I was deep in debt, and had been since I was 18. I was taking care of my family, pets, and a big house full of stuff. I was overwhelmed with every responsibility that a woman could have. I was also newly diagnosed with Multiple Sclerosis, so on top of the usual stuff, I was sick and tired and scared. I started by changing my diet and eliminating meat. Then I took a good look at all of the other things that were causing stress to my body and my life and set out to eliminate them. It took several years, but with the help of my family, I got rid of the clutter, the debt, the shopping, the commitments, and eventually my job and house. Each change fueled the next. It wasn’t what my friends and co-workers were doing, or even most of my family, but I was feeling lighter every day. It wasn’t easy, or fun every day, and there were times when I was really scared to make these big changes. I didn’t get rid of everything all at once, but the more that I let go of, the more space I made for myself to figure out what really mattered. From physical items, to activities, to relationships, I gained great clarity on what I wanted in my life and what I didn’t. And with that, the courage to say no to the excess. I stopped trying to prove my worth by what I owned, or spent, or even accomplished. I felt happier, and my health improved dramatically. Minimalism didn’t ask me to neglect my family or responsibilities, but it did invite me to consider what I really needed to be happy, to raise my daughter, and to nurture my marriage. There are great men living lives inspired by minimalism, and there are great women too. These are women living full lives with big responsibilities who have discovered a better way to live and take care of themselves and the people they love. A few of them write about how simplicity and minimalism have improved their lives. 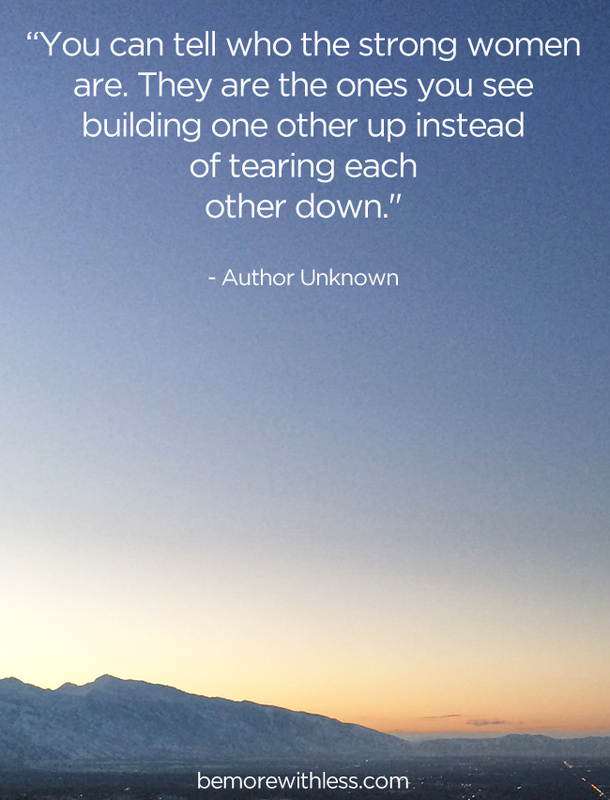 Let them build you up. Tammy and her husband built a tiny house together. She knows that there isn’t a one-size fits all approach to living simply. After spending five years working with survivors of sexual assault and domestic violence, she learned how important it is to talk about options, rather than telling people what to do or what to think. 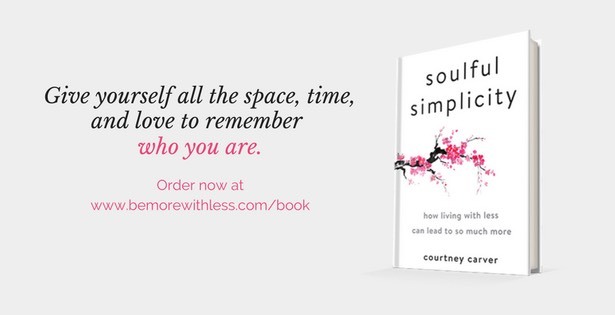 Brooke has learned a lot about what it takes to start simplifying and find happiness in the every day. She lives in Australia with her two children and husband. She writes here: Slow Your Home. Tsh is traveling around the world with her three children and husband. She believes that a passport truly is a portal for the world’s greatest textbook—the actual planet and all her inhabitants. She writes here: The Art of Simple. Natalie used to work too much, and suffered from anxiety and depression. Minimalism helped her focus on her health and relationships, travel more, and live in the moment. She writes here: Sincere Spaces. Francine believes that minimalism isn’t about emptiness for the sake of emptiness — but rather making room to move freely, think clearly, and open ourselves to the beauty and wonder of life. She writes here: Miss Minimalist. Rachel took the plunge in September of 2010 and donated, sold and recycled five car loads worth of house wares, electronics, clothing and furniture. Months later her husband was offered an overseas job opportunity. They sold all of their furniture and donated another car load of belongings before moving. She writes here: The Minimalist Mom. Katy is a library patron, leftovers technician, Goodwill enthusiast, utility bill scholar, labor and delivery nurse, laundry hanger-upper, mother and citizen. She writes here: The Non-Consumer Advocate. Be and her family live the Zero Waste lifestyle. As a result, their lives have completely changed, for the better. They feel happier, and lead more meaningful lives, based on experiences instead of stuff. She writes here: Zero Waste Home. There are many more women who are minimalists and simple living advocates, writing about it or not. Be inspired by their stories and then create your own story that will inspire others. There is room for change in your life, and minimalism can help. P.S. If I can ever be helpful, please let me know. Thank you for writing this and sharing such a wonderful list of minimalist ladies. 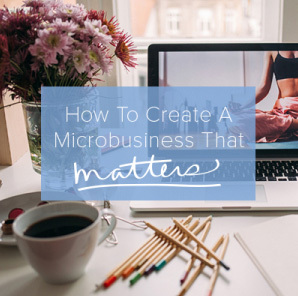 Truth be told, I was a little taken aback by the intro to this post because I have never once thought that only men were or could be minimalists. Although I haven’t thought about minimalism explicitly from a gender perspective, I can absolutely see how women can have a harder time in a society that values stuff-stuff-stuff and billions of dollars targeted at women specifically to buy buy buy (because you CAN buy happiness, they say). Though it’s hard to challenge those values, it’s so worth it in the end. Your story and this post is so moving, Courtney. It never occurred to me that minimalism is not for women probably because I’m single. After reading this though, I feel teary-eyed and deep empathy for all those moms who are overwhelmed and have too much to do. Yeah for waving this flag, Courtney. This post will encourage so many. Thank you for the encouragement and great references/links to other inspiring minimalist women. 🙂 I love that you don’t advocate a ‘one size fits all’ approach and for sharing all the myriad ways we can all simplify. Blessings to you ! Inspiring, and thank you for the resources! You’re never too old to embrace minimalism (I’m 56), and its benefits grow exponentially as I focus on the essentials and experiment with the different ideas offered by the minimalism bloggers. Oh goodness. I’m a woman…wife, mom of 7, and minimalist. I would never think that women couldn’t be minimalists! Well, Courtney, I found 2 new blogs to follow from your list in today’s post. I haven’t de-cluttered as much as I would like but I’m getting there. I’m still recovering from my fun Christmas shopping at craft shows. Oh, and I made a commitment to my BFF on Saturday as she was organizing my art supplies that I wouldn’t buy any new supplies. Gads, only 4 days and it’s not easy. This is great!! I do agree with the fact that woman are expected to do a lot! I’m cutting back on stuff and I’m very happy about. More to reduce but its going in the right direction. Thank you for this post. I’ve always believed that the busier or more complicated your life is, the more you would benefit from minimalism. Simplicity isn’t an isolated phenomenon; it travels from one area of your life to others. REALLY great post! I am by no means a minimalist –yet anyway!–but I am trying to figure out what it means FOR ME, be more conscious of my consumerism and stop over-extending myself. I want to esp figure this out before my husband and I decide to have children. I really hate when women use the fact that they are women as an excuse for anything. It may be my generation though, I never see being a woman as a draw-back to anything. And thanks for the new links…I follow several already but am excited to add some new inspiring voices to my bloglovin feed! I was very surprised to read the title of this post when it came up in my feed because it never even occurred to me that I couldn’t be a minimalist. It isn’t easy and a lot of days I fail, but anyone can do it. This story has encouraged me to keep with it and I hope it helps many women realize that they can live with less too! In my experience, it’s usually men who are packrats and can’t let go of their possession (almost always records, CDs, guitars, baseball cards or other collections). My biggest struggle was getting my husband to agree to drop everything – quit the jobs, sell the house, the cars, the furniture and give away almost everything else – and come along for the ride. Literally. We spent the last two years travelling by bicycle. After living with only what we could carry for that long, we learned that minimalism is so much easier than “normal” life. Thanks to this post, I have learned of three new blogs I should follow for more inspiration! Excellent job. Another woman becoming a minimalist (I don’t think I am there quite yet and my biggest block is my husband and children). I have found that minimalism is actually helpful as a mother. I have housework and cleaning and more time for my family. I have been talking about this a lot on my blog. I have purged and then a few days later, I yearn to purge more. I have gone from being a doctor’s wife with lots of expensive pretty things, to a 57 almost 58 year old woman in a one bedroom patio apartment. Wanting to live a simple life, while basking in the solitude I crave and enjoy. Thaks for this Courtney. Of coure women can be minimalists, but I have to admit I do feel as though we just might have a few challenges. When I read Leo and Joshua, I often wish I could hear from their wives. I have a pack rat husband and two kids who I have trained well not to hang on to things. I have been decluttering for years (mostly to make my housekeeping easier) and I don’t know if I need to get rid of more stuff, yet, or if I am seeking something other than minimalism. There is more than one road to a meaningful and intentional life. But, I appreciate this post immensely. I have been feeling in need of hearing more voices, voices closer to my own. Thanks. I think it’s really important to acknowledge a possible gender difference. Of course women can be minimalists, but within marriages and families they statistically still shoulder more of the household responsibilities, more of the child care/direction of activities, more of the household purchases, more of the management of health and wellness (for the family) and, to top it off, do it within the constructs of a culture that is brilliant at telling women that they aren’t enough, need shinier hair, more shoes, brighter smiles, fewer wrinkles, the right yoga outfit. And think about shopping. For women, it can be social, recreational, emotional. These are generalizations, but there are significantly differing societal expectations and cultural norms that can really block and blind women to minimalism. I used to have a very limited view on minimalism, thinking it only equated to less physical stuff. But as I’ve been simplifying my life, I see that the definitions of simplicity and minimal can be pretty broad. Peace to you on your journey to simplifying. I think one of the reasons why women might feel that they can’t be minimalists is because they feel pressure from society a greater deal more than men. Other people (often women because men don’t notice anyway :)) might talk if they wear the same clothes/shoes over and over again. It’s often suggested that in order to be stylish and a “real woman” you need to have a huge variety of shoes, purses, dresses, make up, you name it. It’s weird for a woman to not like shopping and to not talk about shopping. I’ve actually ran into a couple of people in the past year that suggested that I am odd for living this lifestyle or that once I have kids I will change and begin to “nest” and decorate my home and be more interested in furniture and decorative items (because apparently that’s the normal thing to do when you’re a woman…) and I had to stand up against this and defend my view. Luckily I’ve been a minimalist for 3 years now and so I’m confident about my path and confident about my identity as a minimalist. Nevertheless if I had talked to these people in the beginning, it might have put me off minimalism. It’s not always easy to stand up for what you believe in and even less easy if you’re at the beginning of your way and maybe not 100% convinced of it yet. But I can tell you, I am a real woman and I am a minimalist and those things are not exclusive to each other – keep going ladies! In my relationship, I definitely do more (all) of the cooking, cleaning and laundry in our house. I have found that minimalism makes these tasks much, much easier! Thank you for the reminder -minimalism is for whomever desires it. So often, minimalist blogs are geared for young, healthy(who can sleep on the floor) traveling adults with no children. Your post continually encourages each of us to practice minimalism (owning/doing exactly the dsired amount) based on our individual goals. My husband, four year old daughter and I have embraced minimalism together, creating joyful moments everyday. It is definitely not how I was raised, I am sometimes criticized for it, but it is the life I have chosen for myself and I wouldn’t have it any other way. Having come to the conclusion that I already have enough, my wants are little and I have the time to focus on what really matters – family, friendships, nutrition and becoming well. Hey Courtney! I’m so happy to have had the opportunity to read this! I feel very lonely sometimes at my minimalist journey. You see, I’m brazilian and 24 years old and is pretty difficult to find someone like me. Sometimes I get really inspired by Leo, but I don’t get that connected with him because we are so different! 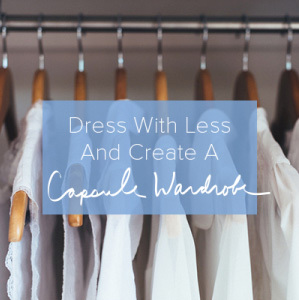 What I learned from you was to use and Capsule Wardrobe all the time and It had change my life! I used to post some pics of it at instagram – and guess? You already liked a few! Thank you dear! (@tate_lopes) And thank you for sharing all this blogs and sites I already am reading them! Have a nice weekend! Minimalism encourages and helps us to prioritize what matters most in life, it doesn’t take away from it. Love your blog – read today’s and found out you have MS. So do I. Great to know a fellow MSer is doing well!! Keep the good tips coming! Through the years, I have simplified family holidays by seriously thinking about what parts are important to us and what are not. I have simplified wardrobes by throwing everything into the washer; anything that didn’t survive didn’t belong here. I have simplified business by deciding what my values are and which things support those values; saying no to any that didn’t fit. There are so many ways to simplify that it is hard to believe anyone can’t find some way that fits them. Plus, you don’t have to be young to travel; we bought a tiny motorhome, sold our house and its furnishings, and moved into the RV once we retired then traveled through all 48 contiguous states. Living in 24 feet will really help you minimize! I absolutely love this article!!! I found & fell in love with the minimalists last year & had the similar thought of “this is easy for single men.” Thank you so much for suggesting these women bloggers, I have added all of them to my bloglovin’ roll & can’t wait to read about all of their journeys. My parents were never extreme hoarders, but they definitely have too much junk. I’ve been working with my mom on going through their stuff, while also thinning out what I own at home, and really hope that we both continue this journey & gain much more than we’ve gotten rid of. Very inspirational! And thanks for pointing out some great minimalist blogs! Another female (trying to be) minimalist here! Really great post, I plan to follow all the links, thanks for sharing. I can see the letter-writer’s point. When I read minimalist blogs, and the author is a man, and he’s doing something different from what the rest of his family is doing, I feel some suspicion. Our culture is one that requires less from men in terms of accommodating the feelings and wishes of others: maintaining social relationships via engagements and gift-giving; time spent managing the body and appearance to the specifications set by others; time spent managing the appearance of one’s home. My personality is not one that naturally gravitates to any of those activities, and that has resulted in pressure on me all my life, in the form of well-meant “warnings” or “tips,” snide comments, heart-to-heart talks, offers to “help,” passive-aggressive notes, ostracism, and/or yelling. By contrast, my husband, who is the same personality type as I am, does not experience much pushback for being a bit of a loner, a dreamer, or an absent-minded professor. The result is that my life is always more complicated than his. Rejecting social pressure to follow one’s own desires is its own kind of complication when you know that you will continue to receive pushback and criticism. It’s not always worth it, in my opinion. When I set my minimalist priorities, one of them is to minimize conflict. That means that sometimes I acquiesce to the desires of others in order to minimize having to explain and justify why I would prefer a more minimalist approach (for example, gift-giving). I don’t think I would have to do that as often if I were a man. That said, I have certainly rejected many social expectations and benefited from them. But I do believe that for women, the cost-benefit equations of minimalism are weighted differently, and that’s frustrating. Thank you for this comment. Your observations are spot on. I am new to minimalism as well. It is wonderful! I realized the difference between cleaning and cleaning out, but even more importantly, just how much crap was keeping me from living presently. Thank you for all these great sources! I have been really interested in minimalism for a long time, and all of the sources I have found have been written by men. It seemed as a man it is so easy!- a couple t shirts, pairs of pants and maybe some shoes. I have struggled big time with this because I feel like the expectations of clothing are so different… Dresses? Skirts? Accessories and jewellery? High heels and shoes for different seasons and outfits? Handbags and purses to accompany all different occasions? The expectations are just different, accompanied by the fact that as a woman I feel very insecure about wearing the same outfit too many times in front of people who may notice where people don’t care/notice if a guy wears the same pants/Tshirt several hundred times. I digress, thank you! This is a valuable list of sources that will truly help me pursue a more valuable lifestyle.